Dolly Parton’s bosom, Jimmy Durante’s nose, Tina Turner’s legs, Gene Simmons’s tongue — they’re all body parts that have reportedly been insured by their owners. So I’m hoping John Krasinski is paying premiums on his face, that wonderful instrument that gave heart, soul, and ironic bite to “The Office” for nine seasons. With slightly raised eyebrows, closed lips, and eyes that silently scream “HELP ME,” Krasinski communicated, more than words ever could, the absurdities of the social microcosm that is the workplace. On Friday, Krasinski returns to series TV with Amazon’s “Tom Clancy’s Jack Ryan,” and I’m afraid his precious face is not put to good use. So much of what has made Krasinski special — his recessive affect, his gentle ranginess, the uncommon angles in his physiognomy — don’t properly translate to a story built on gunfire, charged situation-room meetings, and a very conventional romantic subplot. As an action hero, he has little opportunity to show any subtlety of expression, even though his face begs to be read. What he does have is a general Boy Scout quality that matches up with the Jack Ryan character in this iteration, as a contemporary CIA analyst and ex-Marine who’s getting pulled into the field. Watching the first six episodes of “Tom Clancy’s Jack Ryan,” hereby known in this review simply as “Jack Ryan,” I realized all over again that blockbuster-movie formulas don’t often work on TV. The action template, with its terse stylings and cinematic orange explosions, doesn’t hold up under the intense demand for story and character that comes with serialized storytelling and time to kill. If “Jack Ryan” were more character-driven, like “Homeland” or “Alias,” revolving around a protaganist whose motives are intensely personal and possibly even twisted, it might be more beguiling. But there isn’t much psychology buttressing all the suspense in the show, except for occasional, shallow reminders that Ryan, a loner by nature, has PTSD and that he is bent on stopping the next Osama bin Laden. 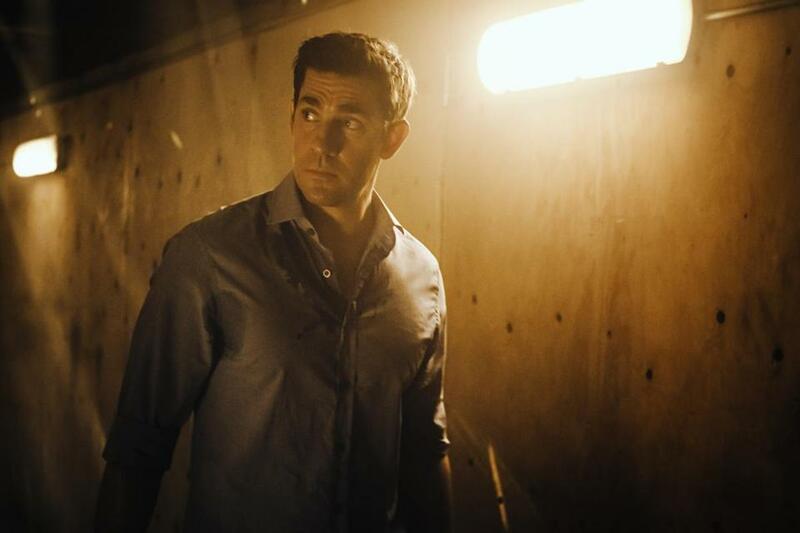 Despite the presence of co-creator Carlton Cuse of “Lost,” a show that was nothing if not singular in conception and execution, “Jack Ryan” is generic. Previously played in the Clancy-Ryan franchise by Alec Baldwin, Harrison Ford, Chris Pine, and Ben Affleck, Jack is just a low-level data analyst, a long way down in the government from where Clancy ultimately takes him. But he’s like Clark Kent. Following some suspicious financial transactions, Jack believes that an Islamic activist named Suleiman (Ali Suliman) may be planning a major attack in the United States. He pursues his theory with his new boss, James Greer (Wendell Pierce, bringing a bit of much-needed humanness), and the two wind up in Europe and the Middle East, pumping up the episodes with chases and close calls. I can’t say any of the tense material truly scares, or awes; it’s just requisite, state-of-the-art action filler, to keep the season-long arc afloat. It doesn’t help that the action sequences spring out of clichéd setups — a pair of meet cutes, for example, first when the bike-riding Jack almost collides with his car-driving new boss, and later when he encounters Cathy Muller (Abbie Cornish) at a party and accidentally trash-talks her father to her. In a twist you can see from miles away, their paths are destined to cross professionally, too. There is an effort to save “Jack Ryan” from turning all Muslims into terrorists, some of which works thanks to an intriguing performance by Dina Shihabi as Suleiman’s wife, who isn’t onboard with the whole attack thing. She projects an intriguing complexity. The flashbacks that attempt to explain the reason behind Suleiman’s radicalization — and paint him as something different from a pure jihadist — are a bit less compelling, but wisely placed at the top of the premiere. There’s also an effort in “Jack Ryan” to comment on drone warfare, as one subplot follows a drone pilot — played by John Magaro — dealing with the moral and emotional fallout of dropping bombs from an office in Nevada. It’s definitely a subject worth exploring dramatically, but not as cursorily and disconnectedly as it is here.